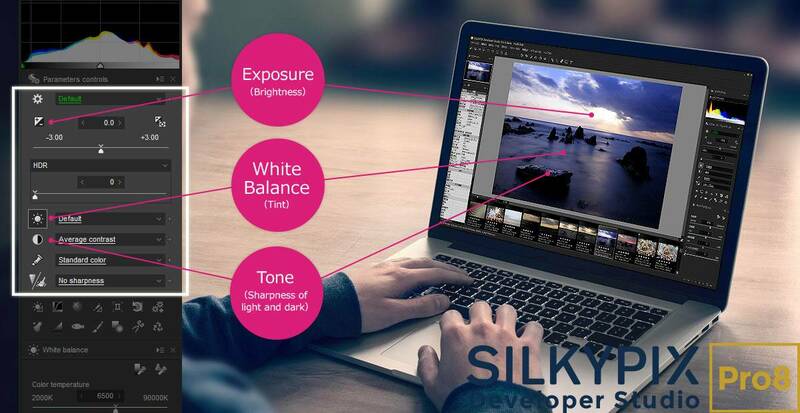 SILKYPIX Developer Studio Pro 8 adds “clarity” that enhances the texture with its own image processing technology. In addition, the correction functions such as adding a brush function to the partial correction tool has been enhanced. This product is RAW development software for professionals. SILKYPIX allows you to make adjustments such as exposure (brightness), white balance (shading), tone (light and dark sharpness) while maintaining a high quality of image without deteriorating the image. In addition, anyone can easily perform high-quality adjustments because basic adjustments are arranged in order from the top of the control panel. Furthermore, fine tuning adjustments for each item can be minutely performed with the “Slider” control. SILKYPIX Pro8 has 10 types of maker tastes installed which can take on various shooting scenes in advance. Just by choosing a taste such as “Landscape” or “Portrait,” you can make a finished photograph easily that fits your image.